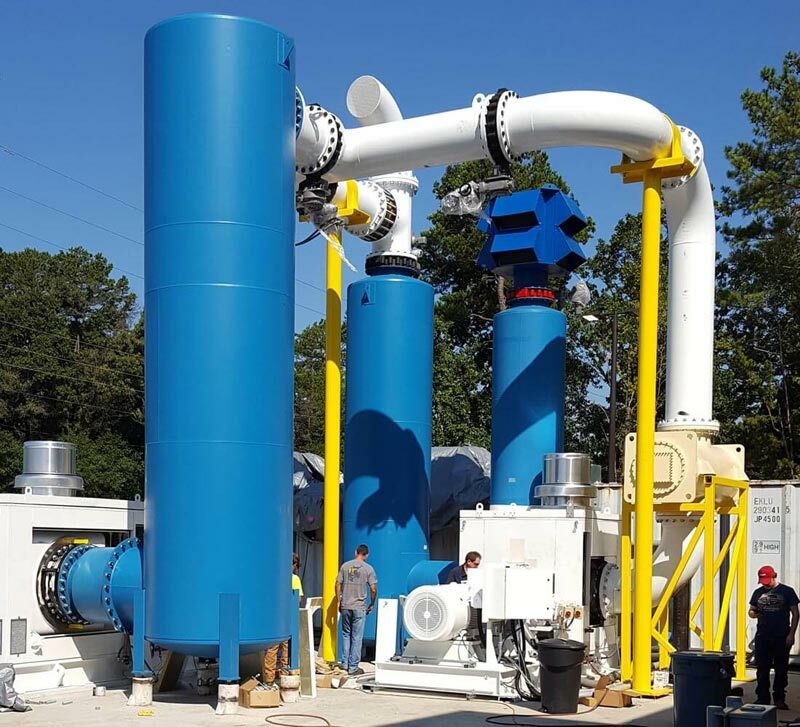 Multi Stage Vacuum Systems - pdblowers, Inc.
We supply a range of industries with vacuum and multi-stage vacuum systems—from the paper industry to oil and gas to aerospace technology. 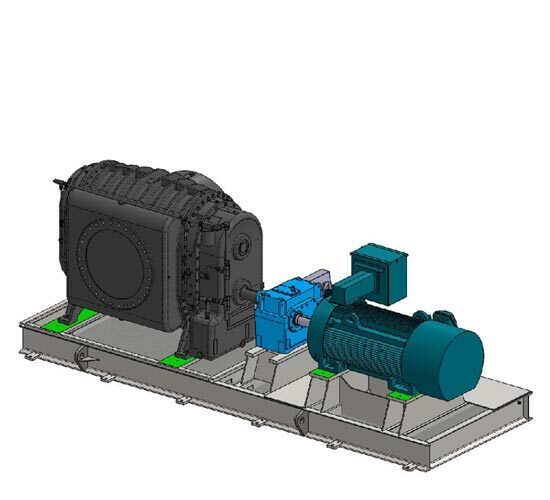 Each system typically consists of a positive displacement vacuum pump, motor and drive, silencer; as well as valves, gauges, guards, filters, and an elevated or non-elevated base. 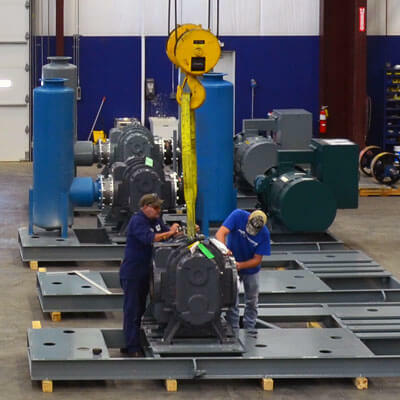 We can perform a full load mechanical test on most systems up to 500 HP to insure proper functioning of all components as a completed package. 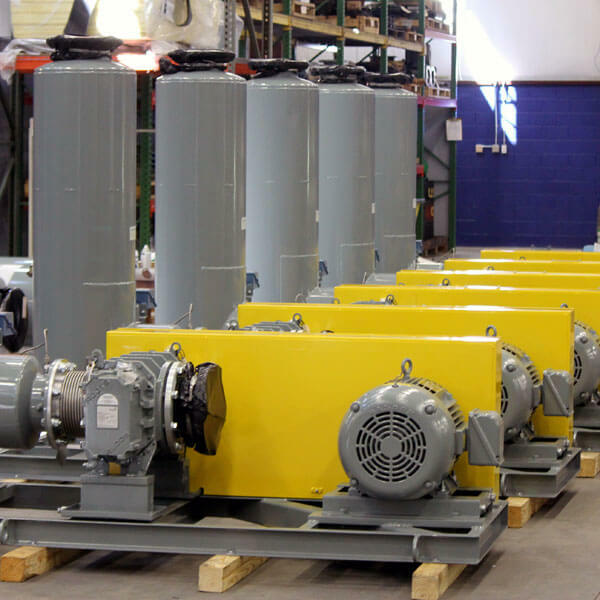 Depending on system size, it may be broken down to smaller skids to facilitate transport or shipped as a completed skid. 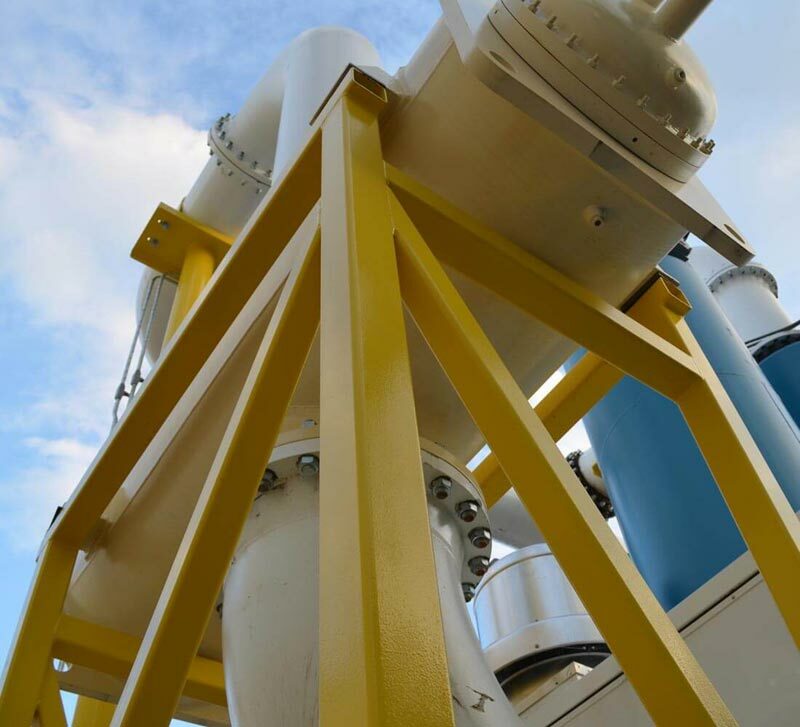 Our expertise and capability extends to many applications that utilize vacuum. We offer complete customization, building each system to perform optimally under specific application conditions. 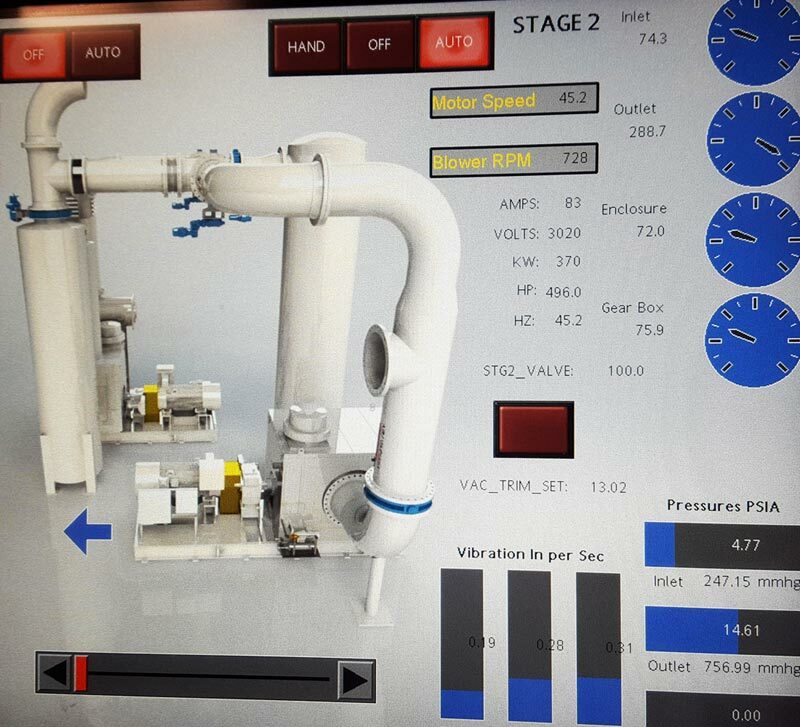 We recently completed an intensive job for an international aerospace company. 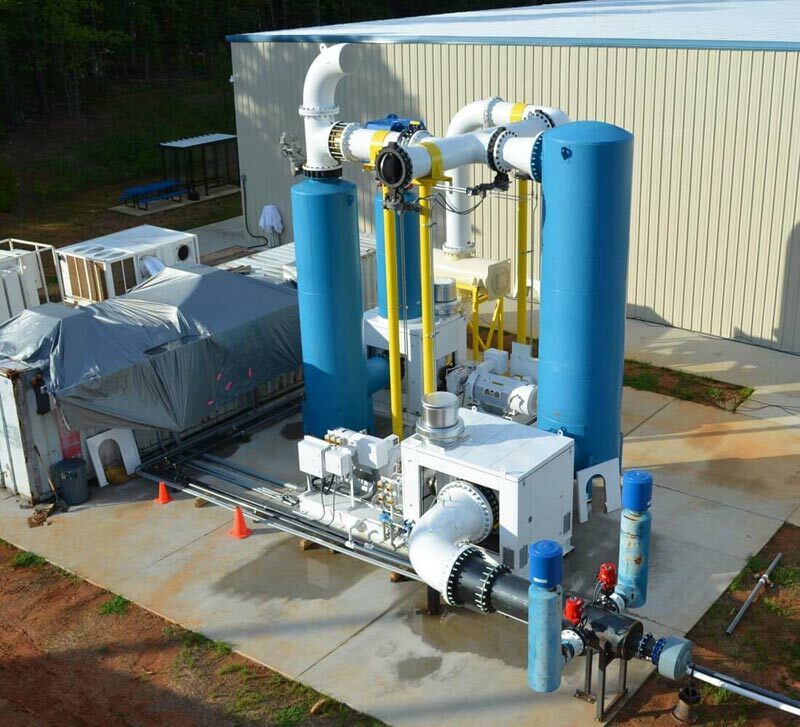 They needed a vacuum system for simulating altitudes up to 48,000 feet in order to test equipment they build and supply. The new package would replace their two stage water injected system which had turned into a one-stage vacuum system when one of the stages went out of service and it always operated at full flow and horsepower. 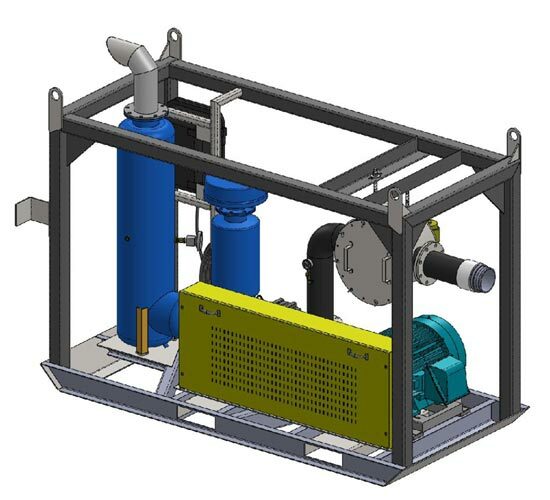 We were asked to provide a solution that would meet variable mass flow and vacuum requirements with a dry system. 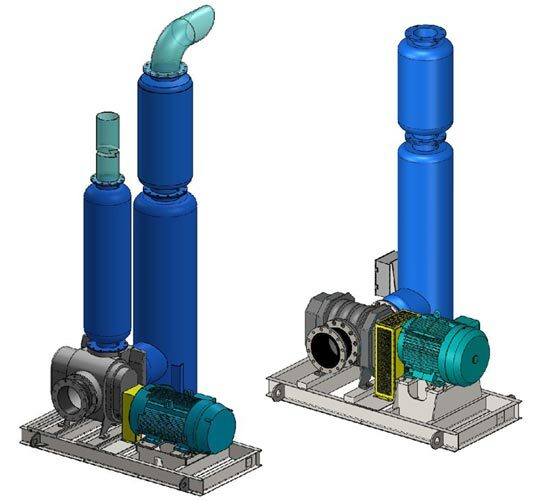 Our application engineers investigated possible solutions and determined that a two stage system with independently controlled stages offered the most efficient solution. 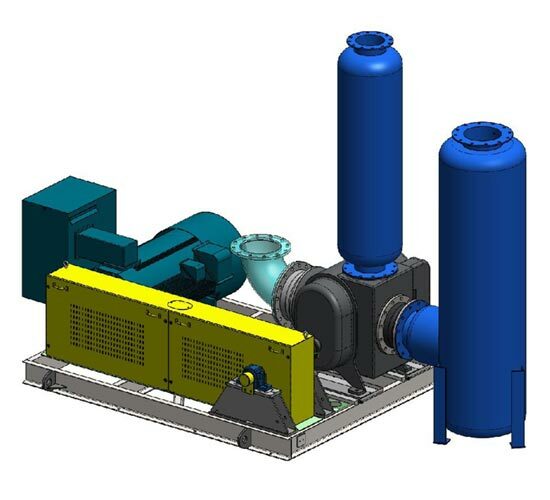 The resulting system required two 800 HP vacuum systems operating on independently controlled VFDs with inter-stage cooling, as well as robust controls to orchestrate operation between the machines. The two-stage vacuum system would simulate altitudes up to 50,000 feet (3.27 inHgA). Controls included several PLCs for a networked system control and an HMI interface. 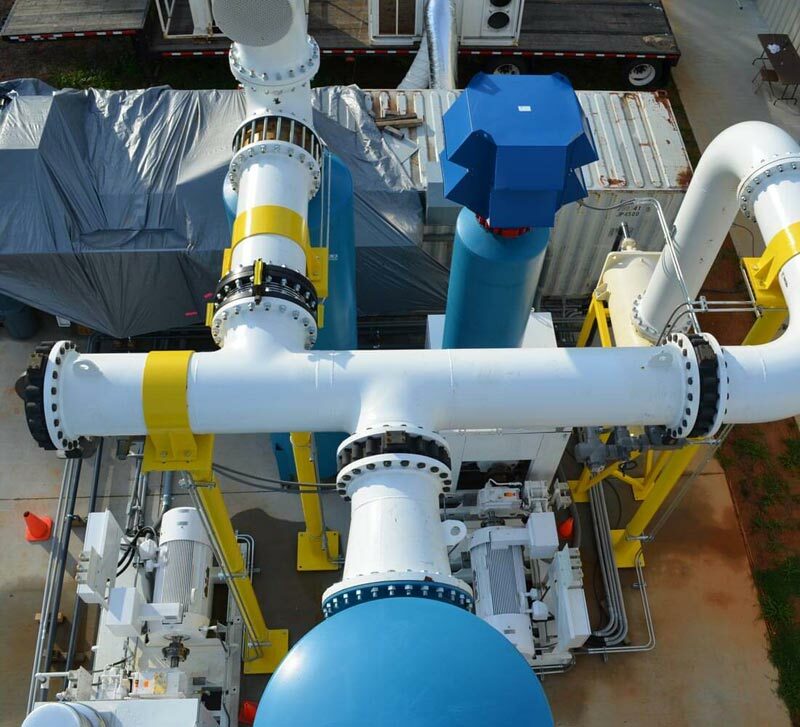 Packaging the system also involved piping and valve up to 30″ in diameter and large system components. Our client asked for a turnkey system. 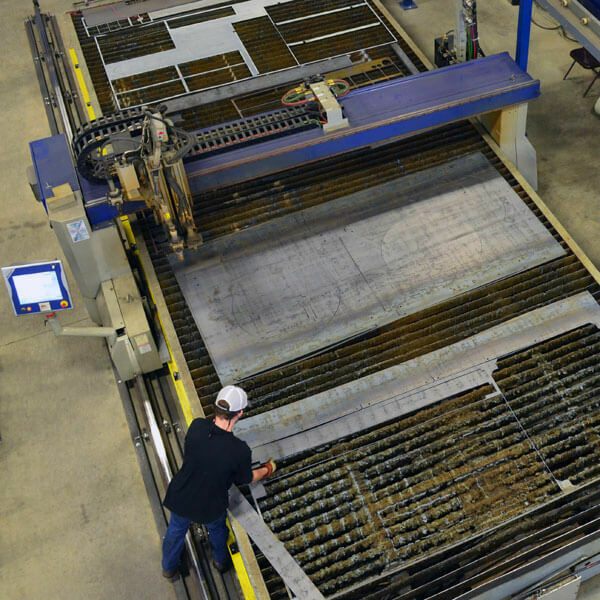 To ensure performance requirements were met, they wanted the system demonstrated at our facility before it shipped. In order to perform the test, we poured a concrete pad at the back of our property on which to lay out and assemble the system. 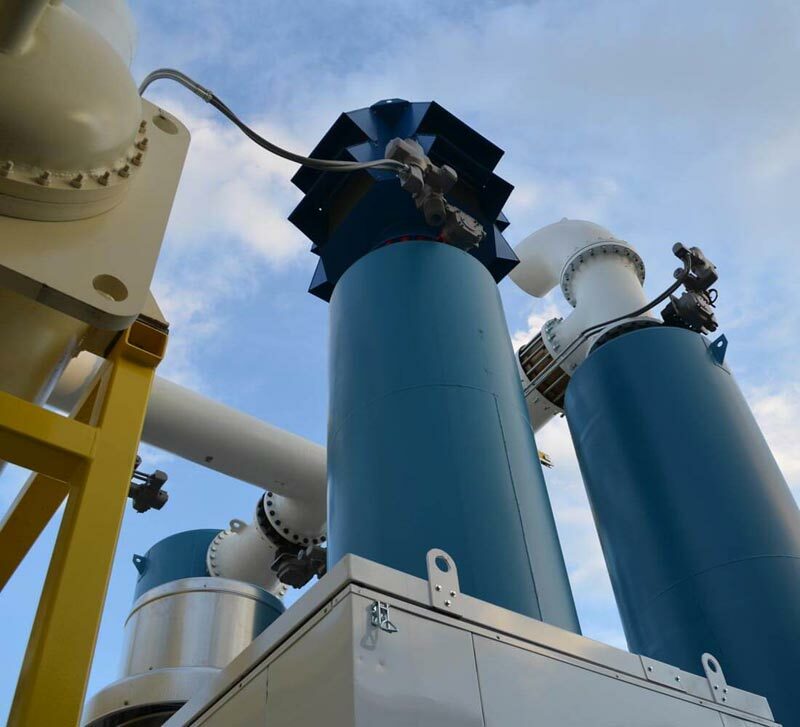 We then mounted the medium voltage switch gear and VFDs inside a 40′ container that required heavy-duty, industrial air conditioning to cool equipment during testing. To power the units, two 1 MW generator sets were rented, along with a transformer to boost the voltage from 460 to 4160 Volts. 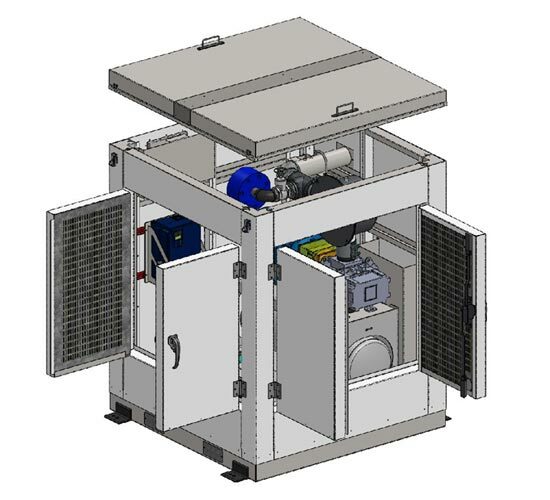 We used a cooling tower system to cool the water used for the intercooler, along with a pump for circulation. All the equipment and instrumentation were wired and the conduit was run back to our control enclosure. 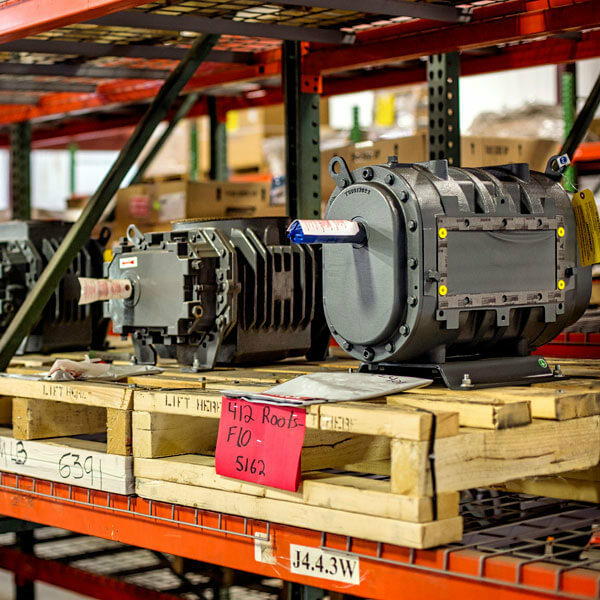 After individual testing of all components, ranging from vacuum pumps to intercooler to controls—we assembled the entire system and tested it. 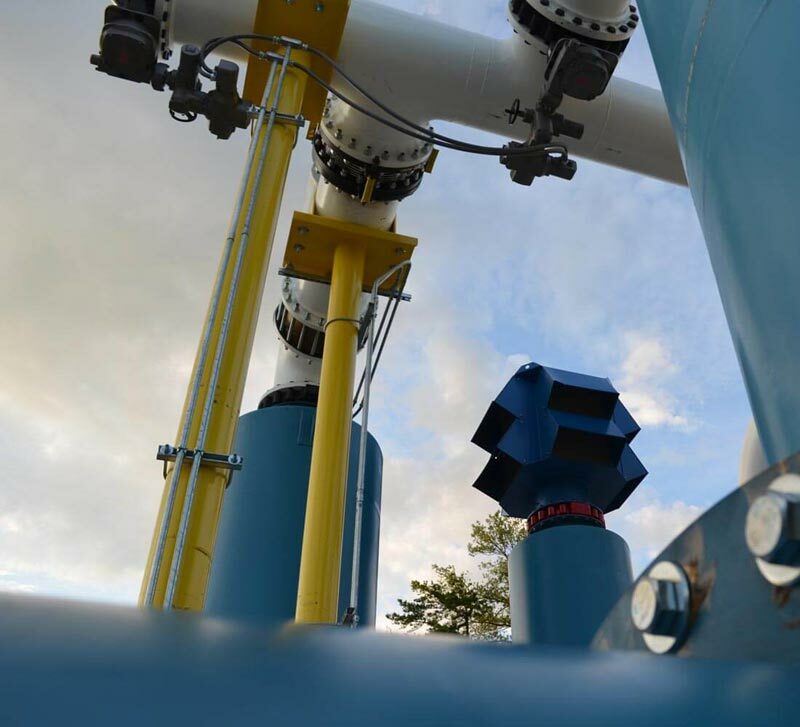 Our client was able to witness their system’s operation, fully functional at all flow points and vacuum levels, before getting it out to their facility. There were no surprises; they knew the system would work as designed. 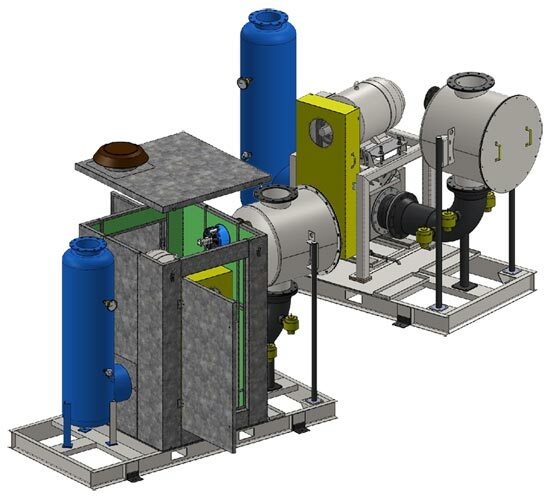 If you need a turnkey system, you can count on pdblowers. 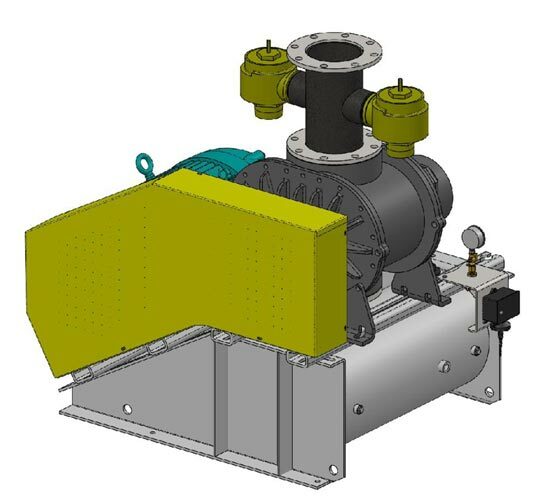 We understand positive displacement vacuum pumps as well as we understand the cornerstone of our business, positive displacement blowers. Contact us to talk about your custom project needs. 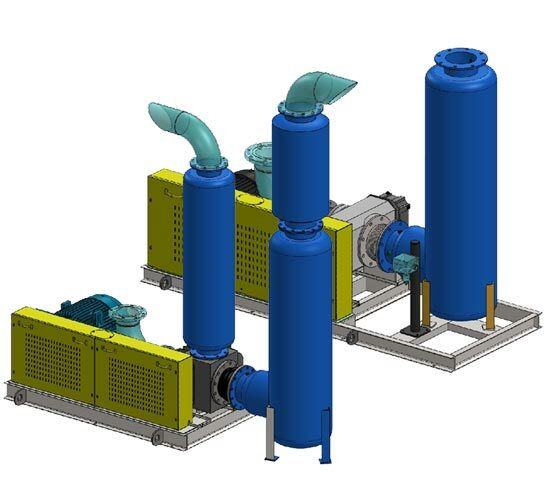 You can also explore our pre-configured single vacuum systems or learn more about vacuum and atmosphere from our Tech Talk reference library.